Percussion works is an award-winning program designed to enhance academic performance in the classroom while building important interdisciplinary skills, such as fine and gross motor skills, cognitive, verbal and math skills, and working cooperatively in a group setting. 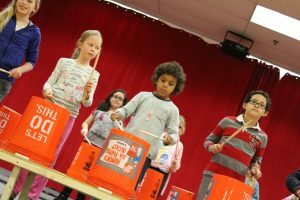 Second through Sixth grade student will learn movement and rhythm along with the basics of bucket drumming. The curriculum will include basic percussive rhythms, reading and understanding music notation, including unique bucket drumming notation. Performance include: Herndon Homecoming Parade, School Concerts, Third Thursday’s Arts Crawl on the Town Green and Friday Night Live! Dates for performances are still to be determined. This is a FREE program and is open to 2nd-6th grade students. The ensemble will meet every Friday after school after school from February 1-May 31. Registration for Percussion Works means you agree to participate in both sessions. There are no make up sessions for cancellations due to snow. *You must pick up your student at the Kiss&Ride door at promptly at 5pm!